Nootropil Benefits | Does Nootropil Increase Brain Power? Nootropil is a trade name for a nootropic drug more popularly called Piracetam (especially in many European countries). It had been developed in the laboratories of a pharmaceutical company in Belgium called UCB (Union Chimique Belge). During its initial tests, scientists were surprised that not only was Piracetam considered a safe drug, but it also did many wonders when it comes to enhancing certain brain functions, even if the person was actually healthy. 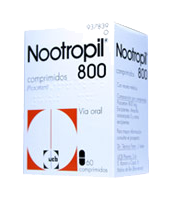 Nootropil is actually used to diminish certain kinds of movement disorders which are caused by brain diseases. This medication is often used to control, if not totally eradicate, the presence of sudden spasms of the muscles. However, the drug has been categorized as a nootropic as it is able to enhance certain brain functions such as in the areas of memory, learning ability, attention and the efficiency of the brain. Most Nootropil users are actually Alzheimer's and senile dementia patients who want to diminish their memory problems, mood changes and behavior disorders and dizziness. Alcoholics experiencing withdrawal symptoms use the drug for treatment as well. Emotional sphere disorders and speech disturbances have also been alleviated with the use of the nootropic. Even in the early stages of developing the drug, Nootropil was found to be a very safe drug, even when it is used on healthy patients. Most reported cases of users showing side effects have all been the mild and transient types. This includes general excitability – insomnia, headache, agitation and tremors – but these are only occasionally reported. Headache is also a common side effect when taking Nootropil. As an additional warning, pregnant women and mothers who are breast-feeding must not use Nootropil. Elderly people and those with decreased kidney functions must use the drug with care. How Does Nootropil Help Brain Function? Various experiments, which are also well supported by the testimonial of Nootropil users, have proven the many benefits that the drug can bring about. For example, it is able to treat the impairment in one's cognitive abilities due to alcoholism. Initial studies have also found that it does the same to Alzheimer's and senile dementia patients although this has to be fully explored yet. Compared to its effect in improving the memory, Nootropil is said to effectively help in lowering feelings of depression and anxiety as well. If you would like to know which supplements outperformed Nootropil in our survey, then take a look at our product review page!